This one adds three new slices, fixes the earth elemental flinger attacks, and has a couple of other small fixes and typos. 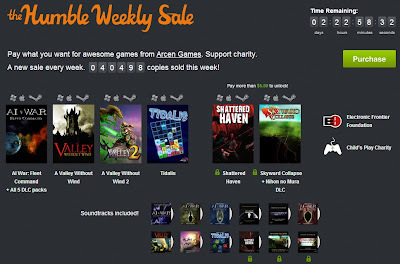 Our Humble Bundle Weekly Sale, which kicked off last Thursday, has now surpassed 40,000 sales and $135,000 earned! With three days* remaining in the sale (at time of writing), we're still trying to get the word out to everyone who might be interested in owning our entire catalog for a Lincoln and change. So special thanks to all those helping with the retweeets, facebook posts, and other methods of spreading the news -- it's massively appreciated. SquiiddishGaming -- Pax Prime 2013- Bionic Dues Gameplay! *Sale ends Thursday, September 12th at 11 AM Pacific. Just a quick post to share that we're running a store-wide sale on our site through the holiday weekend in celebration of the public debut of our upcoming tactical roguelike Bionic Dues -- on display today (and tomorrow) in the Indie Megabooth at PAX. We've matched Steam's discounts on Skyward Collapse (40% off) and the just released Nihon no Mura expansion (10% off), as well as slashed 60% off of AI War (including all editions and expansions), Tidalis, A Valley Without Wind 1 & 2, and Shattered Haven. Hope you like. Have a great weekend!